We are proud to introduce our new line of eco-friendly essentials. 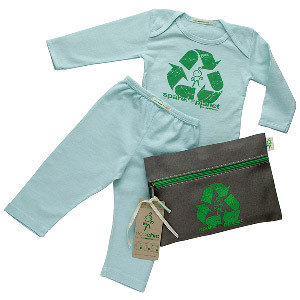 Each certified organic cotton kit includes a soft and luxurious 100% organic cotton jersey long-sleeve tee and matching pant. All garments feature low-impact dyes and water-based eco-friendly screen prints. Our reusable travel case is made even more earth conscious in a slate gray organic cotton canvas featuring a coordinating water-based screen print and a matching green zipper. Our recycle symbol offers our simple message of hope: spare the planet for a better tomorrow.